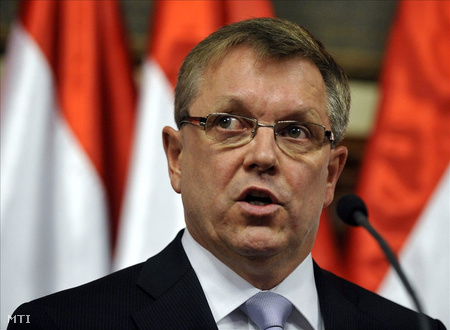 György Matolcsy has been the Governor of the National Bank of Hungary since March 4, 2013. Before that, he served as the second Orbán cabinet’s National Economy Minister, during which time he became noted for his unorthodox economic policies based on the imposition of extraordinary and other special taxes in order to generate government revenue. Grew up in Budapest, where he finished high school in 1973. Went to the Karl Marx University of Economic Sciences in Budapest, where he received a bachelor’s degree in economics in 1977 and a Ph.D. in economics in 1981. Worked as an employee of the finance ministry and various economic-research institutes from 1978 until the System Change in 1990. Was a member of the Hungarian Socialist Workers’ Party during this time (source in Hungarian. Took his first political position as state secretary in charge of economic affairs at the office of Prime Minister József Antall between May and December 1990. Served as the Hungarian Democratic Forum-led government’s representative at the European Bank for Reconstruction and Development (EBRD) in London from 1991 to 1994. Worked at Privatization Research Institute and related organizations from 1995 to 2000 and again from 2002 to 2010. Served as the first Orbán government’s Economic Minister as independent from December 31, 1999 until May 26, 2002. Joined Fidesz in 2003. Elected to National Assembly as Fidesz representative in 2006 and 2010. Was second Orbán government’s Minister of National Economy from May 29, 2010 until March 3, 2013.